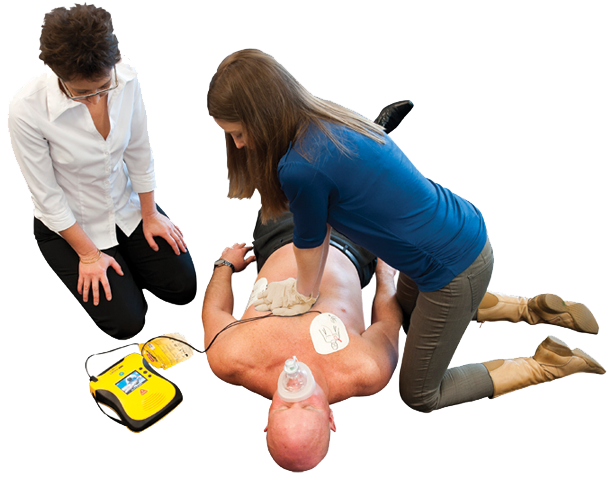 An AED, also known as a defib machine, or an automated external defibrillator, saves lives. They are the only thing that can return someone who is having a sudden cardiac arrest as a result of their heart going into VF -ventricular fibrillation or VT – ventricular tachycardia. Ventricular fibrillation is when the bottom parts of the heart – the ventricles – go all quivery like jelly. When this happens the heart is not effectively pumping blood to either the lungs to get oxygenated, or to pump oxygenated blood to the vital organs of the body including the brain. VF is a common cause of sudden cardiac arrest, and the person will be suddenly unconscious and not breathing. This person needs immediate CPR and access to an AED to put the heart back into a normal rhythm. When we use an AED on the heart, essentially what is happening is all of the heart contracts then all of the heart relaxes. We hope that after this, the heart will return to a normal rhythm. Ventricular tachycardia is when the bottom parts of the heart beat at an abnormally high rate, such as 150 times per minute (when the person is not exercising). Bear in mind that the majority of people have a regular heart rate of between 60 and 80. When the bottom parts of the heart contract so fast, they are not able to refill with blood effectively, and as such are unable to pump blood to the lungs to get oxygenated, or to pump oxygenated blood to the brain and vital organs. Again VT is another common cause of sudden cardiac arrest. A person suffering from VT will also be unconscious and not breathing. And again this person will need immediate CPR and access to an AED to shock the heart back into a normal rhythm. If you are still reading, you might be wondering, well how can I tell if someone is in VF or VT? Well that’s the beauty of an AED. We don’t have to know. What we do have to know is how to recognize if someone needs CPR. This is someone who is unconscious, not breathing or not breathing normally. 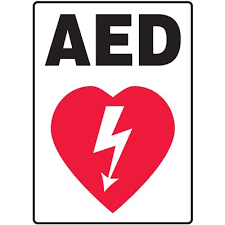 When we use an AED for someone needing CPR, the machine will analyze the electrical rhythm of the heart to see if they are in a shockable rhythm – that means something that can potentially be fixed. If they are in a shockable rhythm, the machine will charge up and deliver a shock. If the person is not fixable by a shock, it will not charge up. So there is no chance of accidently shocking someone who does not need it. If you see someone who is unconscious and not breathing or not breathing normally you should immediately start CPR and get access to an AED. When you get access to an AED you should follow the steps below. Turn the machine on and listen to it. It will recommend you should call 000. Do this. You will need access to the person’s bare chest. To do this you may need to remove or cut clothing to do this. You will also need smooth hair free skin to apply the AED pads to. Scissors or a razor may assist in gaining hair free skin. Place the pads on the person’s bare chest. On the pads will be pictures of where they need to go. Use these as a reference. Once the pads are in place, it will analyze the electrical rhythm of the heart to determine how the heart is contracting. Do not touch the person when this is happening. The machine will tell us when this is happening. 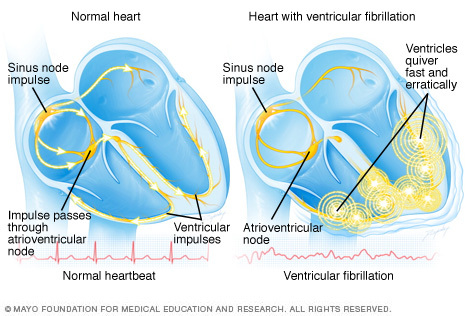 If the heart is potentially fixed by a shock, it will charge up. Some machines are fully automated and some are semi automated. For fully automated, the machine will shock when the voice prompts say. If the machine is semi automated, you will need to press the flashing shock button when the machine instructs you to. When the person is being shocked you need to ensure that no one is touching the person. You also need to make sure that there is no metal or water connecting the person being shocked and anyone else. Once the person has been shocked you may need to recommence CPR on the person. AED machines will continue to advise you on what to do. After 2 minutes, if the person still needs CPR, they may need another shock. The machine will instruct you to not touch the person again while it goes through another cycle of analyzing the electrical rhythm of the heart. If the person is still not in a normal heart beat rhythm, they may need another shock. Again, the machine will talk us through this. Remember AED’s should be accessible to all. You do not need to have any special training to use them. Just turn them on and listen to them. The survival rates for VF and VT are best when an AED is used within the first 4-6 minutes of the person going into these abnormal rhythms. That is why we need to increase the amount of AED’s in our community. And finally any attempt at resuscitation is better than nothing. Jeroki First Aid provides Australia first aid training courses, CPR training, and emergency response training in Melbourne and Bendigo. Contact us today to book your first aid training or private onsite first aid training course. What happens in a stroke? © Jeroki First Aid Training. Digital Agency Melbourne. Australia First Aid Training, CPR Training, Emergency Response Training.